Grants Pass was optimistic in the 1920s. The creation of the Oregon Caves National Monument in 1909 gave an early boost to tourism, as did the completion of the Pacific Highway in the mid-1910s. In 1922 Grants Pass businessmen constituted themselves as the Cavemen to promote the city. The six-story Redwoods Hotel was opened in July 1926 by hotel operator Al J. Martineau. Designed by Frank K. Hummel of the Portland architectural firm of Tourtellotte and Hummel, it was joined to the three-story Josephine Hotel, built in 1893; the new complex was renamed the Redwoods Hotel. The name reflected the recent completion of the new Redwood Highway to Crescent City and San Francisco. Its location on the major West Coast railroad line and these new highways made Grants Pass a cosmopolitan place, no matter that the census, in 1930, showed only 4,666 residents in the city. 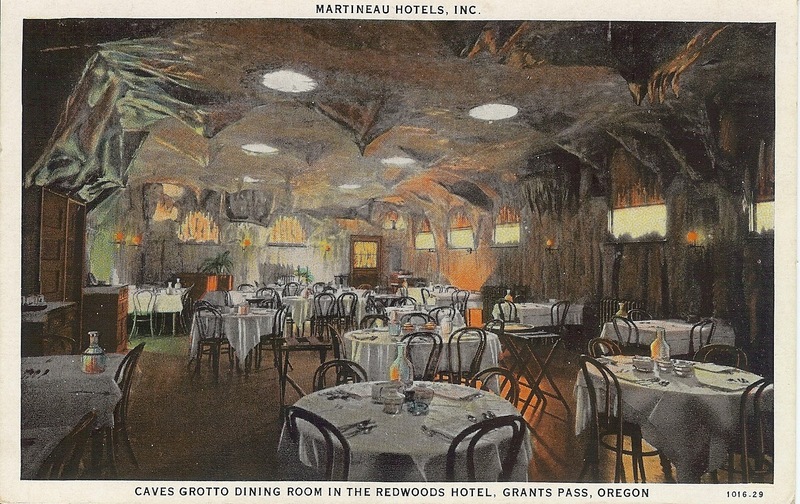 Take a look at the dining room, pictured shortly after the hotel’s opening: the Oregon Caves “caveman” theme is rendered as a swank nightclub. The hotel provided “sample rooms” for the traveling salesmen. These fellows traveled from town to town, stopping to display samples of the wares they represented: ready-to-wear clothing, hardware, dry goods. They came by train, and by the 1920s they were coming by automobile and bus — motor stage — as well. 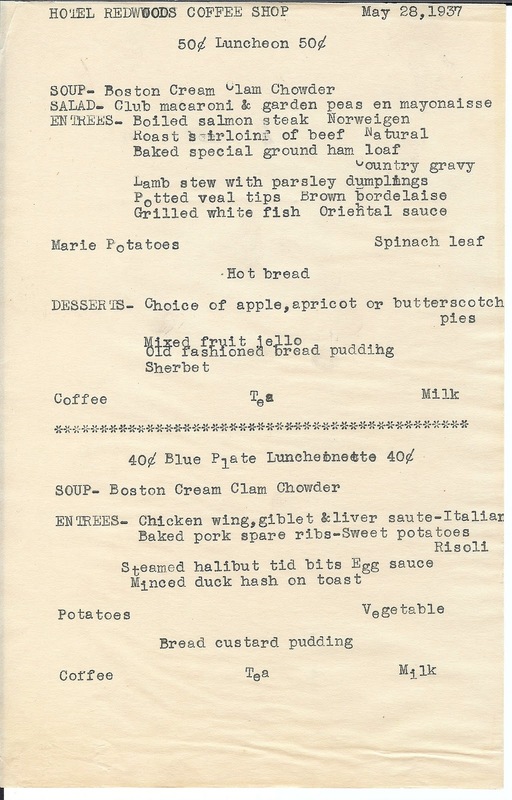 A salesman traveling through Grants Pass in the spring of1937 can eat very well at the Redwoods. While the beef comes from the Swift’s packing plant people, fresh seafood is offered, and both Eastern and Olympia oysters are listed (yes, more about those oysters later!). 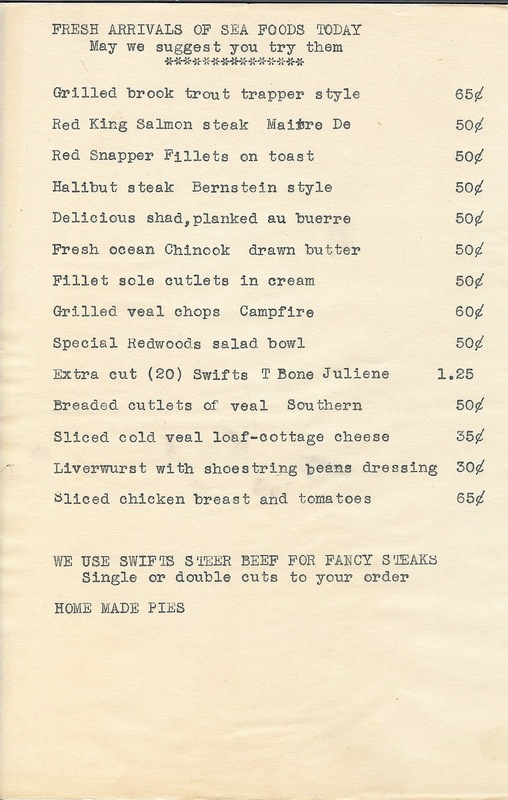 There is a grand effort to cast some Frenchified terms onto the menu, which proves difficult to do with a manual typewriter. The old Josephine portion of the hotel burned in 1975, but the 1926 structure remains, now used as an office building. 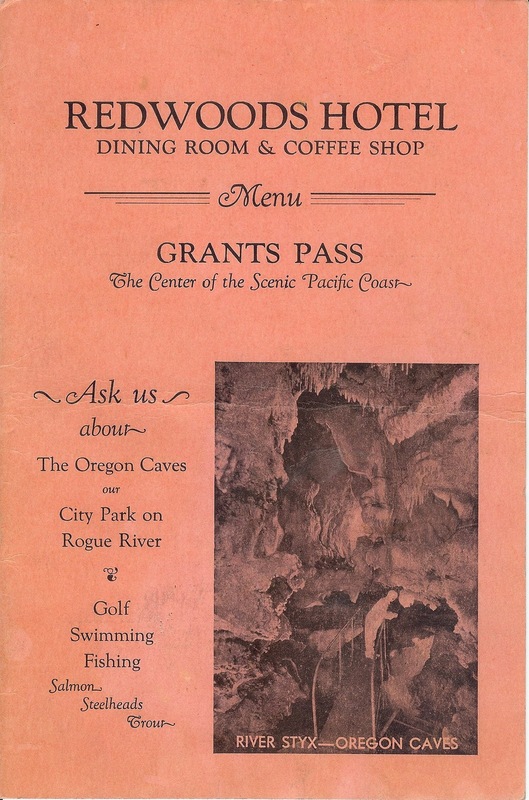 Nothing in Grants Pass today (population: 31,740) quite matches up to the Caves Grotto Dining Room, and you’re unlikely to find a menu offering boiled salmon steak Norweigen or Olympia oyster stew. But the Cavemen are still there, and I’m sure they can direct you to the restaurant that offers a Sasquatch sampler plate and a lumberjack steak. Nicely done, Richard. Actually a portion of the old Hotel Josephine, the "Sample Rooms," that were made available to the drummer trade, survives. It's now a restaurant, as I recall, just west of the concrete parking lot that used to be hotel site. I think it is listed on the NR as the "Hotel Josephine Annex" or something like that. Of course the Redwood Tower shares a lineage with the other T-H "subscription hotels," up an down Oregon, including both the Lithia Springs (Ashland Springs) and Hotel Baker (but you knew that!). Hope you well. Well-done as always! Ye Gods, though, that rendering of the dining room was meant to actually ENTICE people to come?? It looks like it's under construction, or recovering from some horrible flood. Is that black visqueen all over the ceiling? The typewriter needs servicing, I'm afraid. 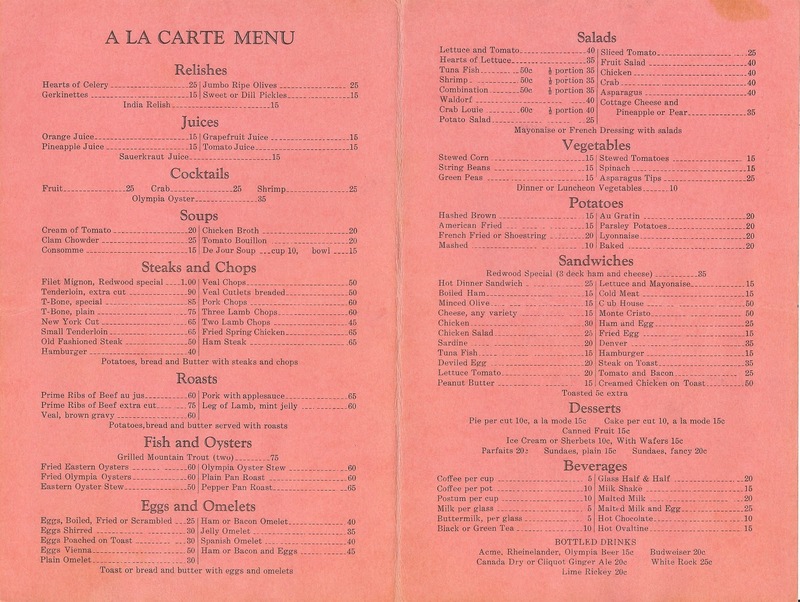 Looks like a menu that Basil Fawlty would crank amid the din of his wife yelling and the bellman chasing his rat….